York Ackworth School Ampleforth College Ashville College Aysgarth School Bootham School Catteral Hall Fulneck School Fyling Hall School Giggleswick School Harrogate Ladies College Pocklington School Queen Ethelburga’s Queen Margaret’s Rishworth School St Olave’s School St Peter’s School The Mount School The Read School Woodhouse Grove Location Taunton is a market town located in the south west of England. Taunton has good rail and road links to London (1 hour 45 mins by train). Exeter and Bristol are both 40 mins by car. English Students all receive 15 hours of English tuition per week with highly qualified teaching staff. Academic Study All pupils have at least 10 hours per week of Academic study in a range of subject choices to help prepare them for GCSE or A level study. Activities Students enjoy a wide range of sports, evening activities and excursions. 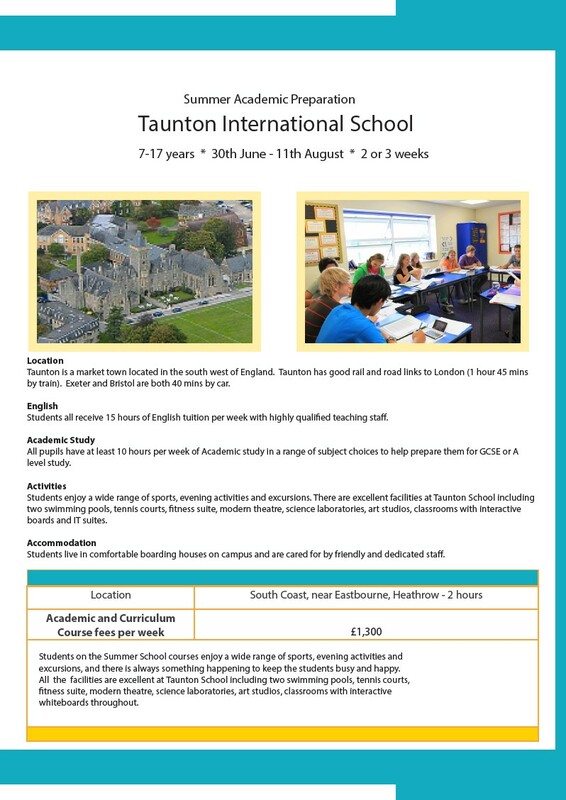 There are excellent facilities at Taunton School including two swimming pools, tennis courts, fitness suite, modern theatre, science laboratories, art studios, classrooms with interactive boards and IT suites. Accommodation Students live in comfortable boarding houses on campus and are cared for by friendly and dedicated staff. East Sussex Ashdown House Battle Abbey School Bede’s Brambletye School Brighton College Burgess Hill School Moira House School Eastbourne College Roedean School Berkshire, Oxford, Buckinghamshire Abingdon School Bearwood College Bloxham School Bradfield College Burford School Cherwell College Cothill House School D’overbroecks Downe House Elstree School Eton College Godstowe Preparatory Headington School Heathfield School Kingham Hill School Leighton Park School Licensed Victuallers Newbury Hall Padworth College Pangbourne College Papplewick School Queen Anne’s School Royal Grammar School Rye St Antony Shiplake College St Edward’s School St Georges School St Swithun’s School Sunningdale School The Oratory School Wellington College Wycombe Abbey School Kent Ashford School Beechwood Sacred Heart Benenden School Bethany School Cobham Hall School Dover College Earlscliffe College Farringtons School Kent College; Pembury King’s School Rochester King’s School Canterbury Kent College; Canterbury Sevenoaks School St Edmunds School St Lawrence College St Leonards Mayfield Sutton Valence Tonbridge School West Sussex Christ Hospital Cottesmore School Farlington School Great Ballard School Handcross Park School Hurstpierpoint College Lancing College Lavant House School Seaford College Slindon College St Andrew’s School Vinehall School Windlesham House Worth School Summer Academic Preparation Taunton International School 7-17 years * 30th June - 11th August * 2 or 3 weeks Location South Coast, near Eastbourne, Heathrow - 2 hours Academic and Curriculum Course fees per week £1,300 Students on the Summer School courses enjoy a wide range of sports, evening activities and excursions, and there is always something happening to keep the students busy and happy. All the facilities are excellent at Taunton School including two swimming pools, tennis courts, fitness suite, modern theatre, science laboratories, art studios, classrooms with interactive whiteboards throughout.